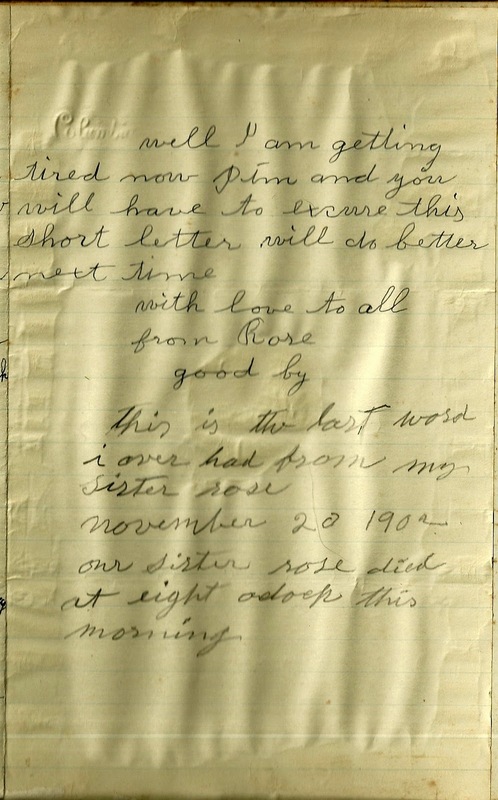 July 28, 1902 letter from Rosamund F. (Moore) Frazier to her brother James Moore of the Lakewood district of Ellsworth, Maine. She realizes that she is very ill and says "Good By" at the end. James added a note to the letter that this was the last word he ever had of his sister, who died a few months later, on 20 November 1902. The letter is pasted on the inside front cover of a journal that James Moore kept of the last two years of his life, plus an entry from 1868, two from 1869 and one from 1892. 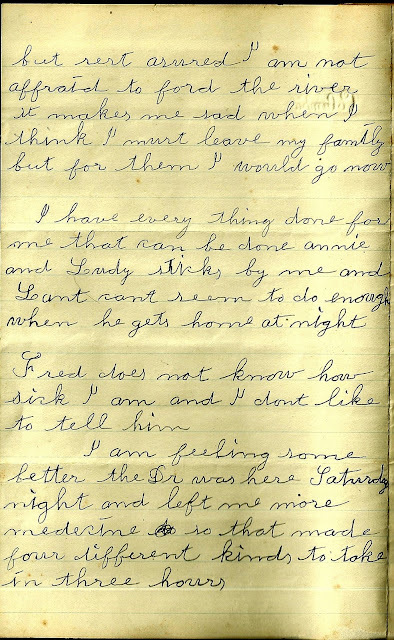 The diary describes a life of farming, wood cutting and daily joys and all too frequent illnesses and deaths. I'm in the process of transcribing the diary and 4 companion volumes that were kept by James Moore's daughter in law, Vesta Estella (Garland) Moore, wife of Winfield Scott Moore. Rosamund F. Moore was born 6 January 1840, the daughter of Gary Townsend Moore and wife Mariam Garland. Her paternal grandparents were John and Polly (Townsend) Moore. Her maternal grandparents were Josiah and Sarah "Sally" (Swett) Garland. In 1858, she married Frederick L. Frazier, who was born 25 July 1833 in Maine, the son of George and Barbara (Garland) Frazier. I don't yet have the names of his parents. Barbara's parents were the Josiah and Sarah "Sally" (Swett) Garland, mentioned above as grandparents of Rosamund F. Moore. I found at least two daughters for Rosamund and Frederick Frazier: Annie M. and Octavia Ella. Octavia died young. Annie married Frank Fletcher, but they were apparently divorced by the time of the 1900 Census. On 29 May 1902, shortly before the date of her mother Rose's letter, Annie married Alanson Jellison, who is likely the "Lant" mentioned on page 2. Annie and Ludy or Sudy [possibly Annie's daughter Susan] are also mentioned. Annie and Alanson had a daughter Helen, born after her grandmother Rose's death. 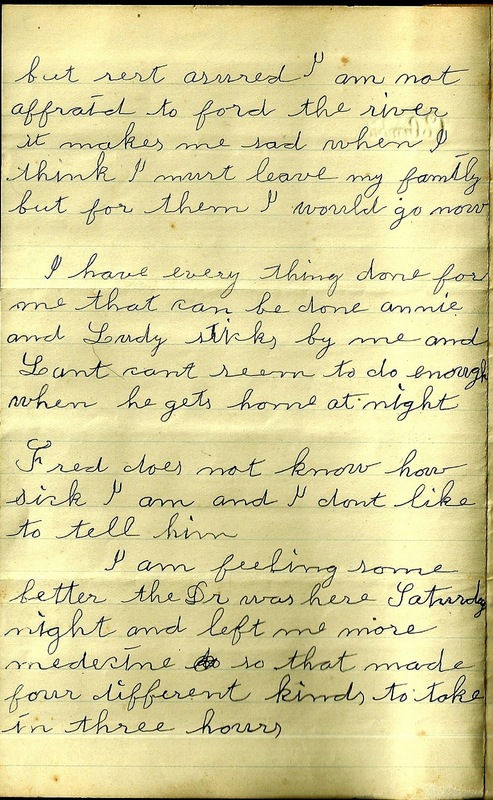 It's very sad, though understandable, that this ailing brother and sister, who both lived in Ellsworth, were unable to see each other toward the end. Ellsworth, I've read, is one of the largest cities in the country, area-wise, James lived in a remote area of Ellsworth, and it's doubtful there was a car in the family in 1902. I received your kind and welcome letter was glad you were feeling some better so you could write me. Yes we must be satisfied as we can’t see each other, in expressing our thoughts on paper. No Jim I would not have you come down and hurt your back. I would like to see you all and the dear old home where I have spent so many happy hours. This may be my last sickness and but for my family I should ask for a speedy relief for I have suffered more than I can ever tell, but rest assured I am not afraid to ford the river. It makes me sad when I think I must leave my family, but for them I would go now. I have everything done for me that can be done. Annie and Sudy stick by me and Lant can’t seem to do enough enough for me when he gets home at night. Fred does not know how sick I am, and I don’t like to tell him. I am feeling some better. The doctor was here Saturday night and left me more medicine so that made four different kinds to take in three hours. Well, I am getting tired now, Jim, and you will have to excuse this short letter. Will do better next time. 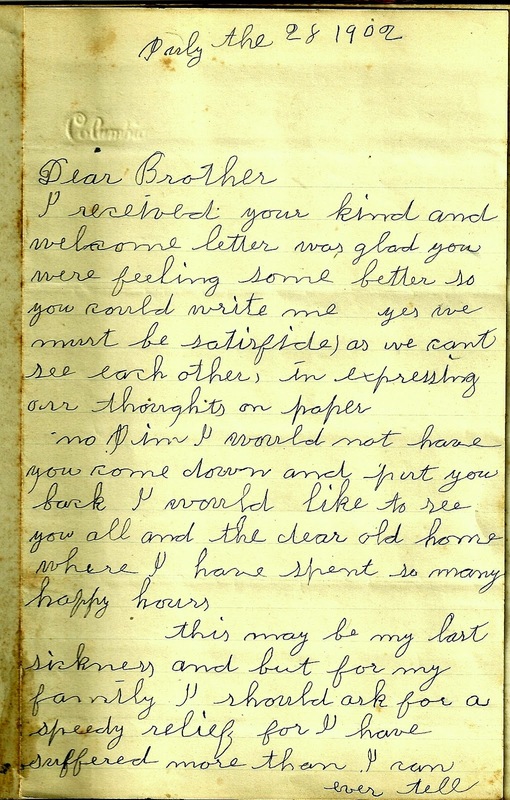 Following is the note written by James Moore at the end of this letter, which he obviously considered very precious. This is the last word I ever had from my sister Rose. November 20, 1902 our sister Rose died at eight o’clock this morning.